Visiting Bhagsu Waterfall and Kangra Valley will get you outdoors. Next up on the itinerary: indulge in some personalized pampering at some of the best spas, explore the activities along Dal Lake, admire all the interesting features of Norbulingka Institute, and take in the spiritual surroundings of Dalai Lama Temple Complex. For photos, reviews, where to stay, and other tourist information, you can read our Dharamsala travel route tool . Pune to Dharamsala is an approximately 5-hour flight. You can also do a combination of flight and taxi; or drive. Cap off your sightseeing on the 22nd (Sat) early enough to go by car to Manali. Escape the urban bustle at Solang Valley and Beas River. There's still lots to do: relax and rejuvenate at some of the best spas, cruise along Rohtang Pass, hit the slopes at Solang Nullah, and admire the sheer force of Jogini Waterfall. For photos, more things to do, where to stay, and other tourist information, refer to the Manali day trip tool . Drive from Dharamsala to Manali in 5 hours. Alternatively, you can take a bus. Wrap up your sightseeing on the 25th (Tue) early enough to drive to Kaza. Kaza, is the sub-divisional headquarter of Spiti Valley in the district of Lahaul & Spiti in Himachal Pradesh. Its located at 3600 ASL and is a cold desert. On the 26th (Wed), don't miss a visit to Komick Village, take a stroll through Hikkim, then appreciate the views at Spiti Valley, and finally contemplate in the serene atmosphere at Komic Monastery. To find reviews, other places to visit, and other tourist information, read our Kaza trip planner . Drive from Manali to Kaza in 5 hours. Finish your sightseeing early on the 26th (Wed) to allow enough time to drive to Sangla. 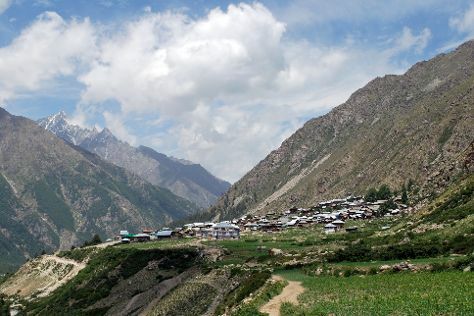 On the 27th (Thu), take in the awesome beauty at Chitkul and then wander the streets of Rakcham. To see other places to visit, where to stay, reviews, and other tourist information, use the Sangla journey planner. Drive from Kaza to Sangla in 6.5 hours. Finish up your sightseeing early on the 27th (Thu) so you can go by car to Shimla. Start off your visit on the 28th (Fri): admire all the interesting features of Indian Institute of Advanced Study, admire the landmark architecture of Viceregal Lodge, then don't miss a visit to The Mall, and finally take in the awesome beauty at Kufri Fun World. Here are some ideas for day two: don't miss a visit to The Ridge, pause for some serene contemplation at Christ Church, explore and take pictures at Gaiety Heritage Cultural Complex, then contemplate in the serene atmosphere at Jakhu Temple, and finally take in the natural beauty of Hotel Hot Spring Therme & Spa. For ratings, reviews, and tourist information, you can read our Shimla online trip itinerary builder . Traveling by car from Sangla to Shimla takes 7 hours. Wrap up your sightseeing by early afternoon on the 30th (Sun) to allow time for travel back home.